On May 2, 1952—virtually 60 years ago—36 people boarded BOAC’s De Havilland Comet DH 106, known as “Yoke Peter” to its crew for last letters of its registration G-ALYP, took their seats and readied for a long journey. These were the first paying passengers of the modern jet age, departing London for a 7,000-mile trip to Johannesburg, South Africa. Powered by four Ghost jet engines (also made by De Havilland) and with a cruise speed listed at about 500 mph, the passengers rode in pressurized comfort. About the only significant difference between that day and now was the legroom and the ratio of passengers to fight attendants. But if we pay too much attention to the similarities we’ll miss what is remarkable about the span of time involved. It’s been 60 years since the first passengers rode on a jet airliner and we’re still flying at the same speeds and the same altitudes. There was a brief interval during which the wealthy could travel at Mach 2 on the Concorde (slightly faster if they wanted to fly the Soviet Tu-144), but neither airplane was ever a commercial success: both were just items of national prestige. If it seems as though little has changed in the last 60 years—I said seems—consider how much changed between 1903 and 1952: call it the first 50 years of flight. It was on a wintry day in 1903 that two brothers from Dayton, Ohio, succeeded where no one else had, on the sand dunes of Kill Devil, North Carolina. Wilbur and Orville Wright were hardly the only ones trying to figure out flight at that time; there were quite a few in the US and in Europe, and most were further along than the two brothers. Even worse for the brothers, their competitors seemed to be better educated or better funded, as in the case of Samuel P. Langley of the Smithsonian Institution, or at least further along in the quest. The brothers made up for this with an intellect that the made their lack of a high school diplomas irrelevant. They learned the value of a wind tunnel by building their own, and they were smart enough to figure out that everyone before them had been wrong about the relationship of lift, wing area, and velocity, to say nothing of airfoils shapes. They had that rarest of talents, what Eugene Ferguson called “engineering in the mind’s eye,” the ability to move back and forth between the abstract and the concrete when trying to solve an engineering problem. They recognized propellers as rotating wings in the process. They understood wing warping and, more importantly, figured out the vertical stabilizer as the solution to adverse yaw, which they encountered on their glider, and they managed to do so largely because of how they mingled the abstract and the concrete. With Charlie Taylor, they put together a 180 pound, 12 horsepower engine with a good enough thrust to weight ratio to fly. It was an ungainly airplane, unstable in all axes, and I’m certain that only the hours of practice with the gliders gave them the skills needed to control the airplane. Then again, the same goes for riding a bicycle: it too, is unstable and takes time to learn how to ride, but you are then rewarded with a contraption that is nimble as can be, as opposed to a four-wheeled wagon. Progress came quickly. 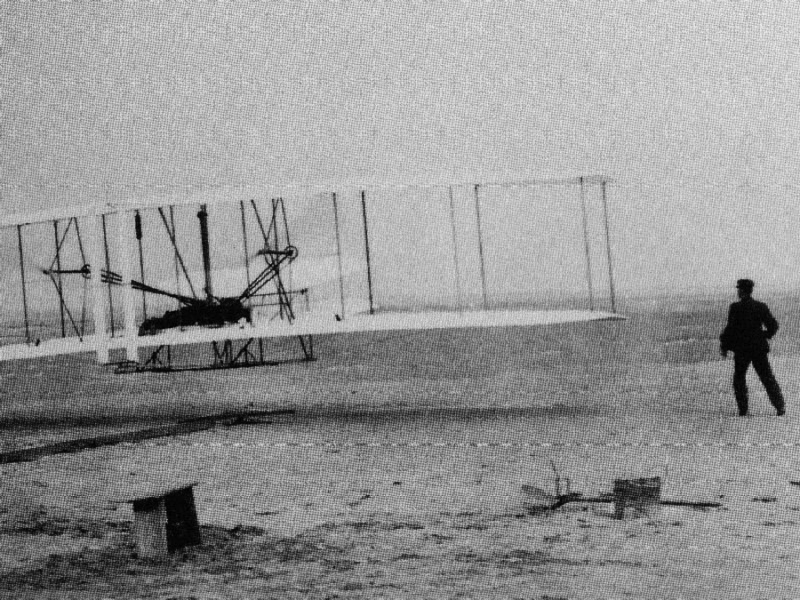 Although canard configurations have returned, the Wright’s pursued their original aircraft configuration until 1909, when they added an elevator and larger vertical tails. The 1910 Wright Model B had no canard and engines with 28-42 hp (with a production run of about 100 airplanes). Their competitors settled into the more conventional wing/rudder/elevator configurations and everywhere advancements in capabilities and performance quickly followed (ditching wing warping in favor of ailerons was a way to control the airplane and try and avoid the Wright’s patent). Aircraft manufacturers proliferated across Europe and the United States. Although we think of this as the era of the biplanes (and triplanes), monoplanes like the Nieuport 2 were being built by 1910! The Loughead Brothers (later Lockheed) formed their first aircraft company in 1912 in Santa Barbara. The first aviation meet in America was held in Los Angeles (Dominguez Hills) January 1910 and airplanes were still so relatively new enough that dirigibles were a huge draw even then. The speed with which aeronautical technology developed is astonishing and I consider this first decade one of the golden eras of aeronautics. We made big steps from the first ‘practicable’ airplane to modern aircraft. War had much to do with this, as it often does–in this case it was WWI. That war brought the first monococque fuselage, the interrupter gear, vastly improved flight instruments, the first UAV (the Kettering Aerial Torpedo, whose flight was made possible by Lawrence Sperry’s autopilot of 1914), the first all metal aircraft (Junkers J1, J2, and finally, the truly functional J4), just to name a few. The rapidity of the developments and their dramatic appearances likely makes us think war is the prime driver in such changes. But if we look at the bigger picture, this seems to be less the case. After all, the Wrights achieved flight in a period of peace and were themselves not driven by any war, even if their first customer was the US Army Signal Corps. The first four-engine aircraft, Igor Sikorsky’s Ilya Mourometz appeared in 1914 in Russia, before The War. It was during the interwar years, the period between WWI and WWII, that NASA’s predecessor agency, the NACA (National Advisory Committee for Aeronautics) developed or assisted in developing some of the most fundamental changes to aeronautics, including retractable landing gear, the variable pitch propeller, deicing boots, engine cowlings, and the world famous NACA airfoils. It was in this same era that the first superchargers were developed to allow piston engines to gain higher altitudes (and speeds), and we saw the first genuine pressurized fuselages. It was in 1928—long before WWII began—that Englishman Frank Whittle conceived of the turbojet, and still before WWII that German Hans von Ohain succeeded in flying the world’s first turbojet, developed independently of Whittle. And while people first paid to travel by air before the War, it was in the interwar years that commercial aviation actually took off, so to speak. WWII drove more aeronautical developments, of course, one of the subtler ones being the abandonment of seaplanes as the preferred way to carry passengers on long routes. The war resulted in plenty of new runways all over the world as well as an abundance of multi-engine aircraft with long range, making the big seaplanes a dying breed. It also helped that long-range navigation and radar approaches were improved and created, respectively, because of WWII. Piston engine/propeller aircraft had been having trouble with the transonic realm before WWII; figuring out supersonic flight was the next big challenge, and while folks in the Army Air Corps and the NACA expected it to be a big challenge, I don’t think they realized just how big the leap into the unknown would be. Getting to Mach 1 could be done with a turbojet engine, but if you were in a hurry to do it—and the AAF was—you were going to need a rocket plane. Jet engines of the era simply weren’t powerful or reliable enough to do the job-yet. This led to the Bell X-1, two X-1s actually, and the quest for supersonic flight. This was dawn of the golden age of flight research and X-planes, of almost infinite questions and purpose-designed aircraft like the X-3, the X-4, and the X-5. In 1961 TWA introduced in-flight movies on its Boeing 707s. By 1964 we had gone Mach 3 in a jet powered aircraft (A-12/SR-71), faster in rocket planes; we’d been to space and back in capsules and a space plane (the X-15), and supersonic flight was routine, at least for the military. In 1970 Boeing introduced first the “jumbo” airliner, the 747, and we’ve been packing in more and more passengers ever since. Yet we’re still flying at virtually the same speed and altitude as those 36 passengers on “Yoke Peter” in 1952. Have things really not changed? Are we in the doldrums, and if so, why? Weather was on the warm side as we prepared for another mission in NASA F/A-18 #852 testing the Mars Science Laboratory landing radar, but it was still a great day to go flying. After intensive and lengthy ground operations on the order of an hour in the aircraft, we taxied out for our flight. We climbed up to 48,000 feet altitude and lined up for the first series of dives. We flew dive angles at 20, 30, 45 and 60 degrees. 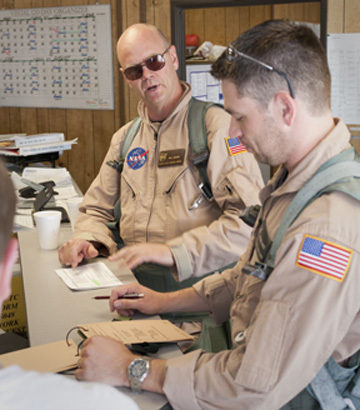 Image right: NASA research pilot Nils Larson, left, and Mike Holtz review flight test cards before a test mission in an F/A-18. The MSL radar within the QTEP – Quick Test Experimental Pod – was set to run several different gimbal angles, some locked and some actively slewing, all with the intent of radiating off the lakebed in some combination with the dive angles from the F-18. All but one test point on the flight cards was achieved before we hit our “bingo,” or minimal fuel remaining, and we had to land. The radar was developed by NASA’s Jet Propulsion Laboratory, and the JPL engineers were very happy with the flight. The radar engineers said the data looked fantastic. A very good mission, plus I’m pretty sure I lost 5 pounds sweating in the cockpit!